The Mazda6 is well known as the best driver’s car in the mid-size sedan segment. It gives you with a great mix of handling, ride, and driver enjoyment. The 2018 Mazda6 inherits its love of the road from its sports car sibling, the MX-5. The 2018 Mazda6 is Mazda’s mid-size sedan. It first debuted in the Mazda lineup in 2002. 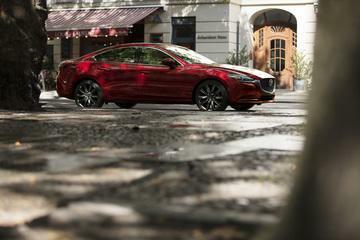 The new Mazda6 is the fifth year of the third generation model. It has many significant upgrades that give it a much more upscale appeal. Mazda has been creating a new premium feel for its vehicles. This trend started with the three-row CX-9 SUV, which was given a luxurious Signature interior trim since it was released for the 2017 model year. Fifty-five percent of all 2017 CX-9s have been purchased with one of the top two trim levels, the Signature or the Grand Touring. The new Signature trim on the new Mazda6 sedan car features authentic high-quality materials, which include UltraSuede made with a subtle gold tint, using a similar technique to that used to make silk kimonos; brown Nappa leather, whose color is inspired by the aged wood in ancient Japanese temples; and accents of Sen wood, which is used in the making of Japanese furniture and drums. The standard 2.5L four-cylinder engine on the new 2018 Mazda6 is a new engine, with 187 horsepower and a unique cylinder deactivation feature. It has a special centrifugal pendulum in the engine, which allows it to run smoothly while using only two cylinders, improving fuel efficiency. This is not only a first for Mazda, but is also the only four-cylinder engine in the North American market that can deactivate its cylinders. The new 2018 Mazda6 has boosted its performance. An available new 2.5L SKYACTIV-G turbocharged four-cylinder engine has 250 horsepower, with a huge 310 lb.-ft. of torque. This is comparable to the torque you get from a 4.0L V8 engine! One more excellent feature you’ll find on the 2018 Mazda6 sedan car is the availability of a smooth-shifting six-speed manual transmission with the standard engine. This is great news for those of you who like to row your own! A six-speed automatic is optional on the standard engine, and comes standard with the turbo engine. If you’re in the market for a gorgeous sedan car that drives like a dream, and has a super-luxurious interior, get behind the wheel the new Mazda6 from Yarmouth Mazda in Yarmouth. Contact us for a satisfying and very comfortable test drive.